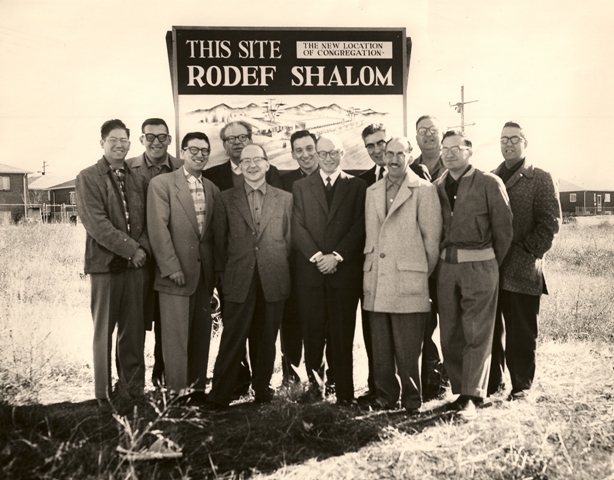 In 1953, a small group of people committed to Conservative Judaism, met at the home of Dr. and Mrs. Myron Wilkoff to organize a new synagogue in Denver. At that meeting, Dr. Wilkoff was immediately elected president and the other Officer and Board of Director positions were filled. A name was selected, Congregation Rodef Shalom," and we immediately became affiliated with the United Synagogue of America, the national organization of the Conservative movement. A Rabbi was hired. Rabbi lsaac Freeman, and Jake Cohen were hired to organize and run the Religious School, as well as handle Cantorial duties. We even started, our own choir. Torah Scrolls were given to us from Elizabeth Wolf and from members of the Tenth Street Shul. Services were held at members' homes on a rotating basis after efforts to use public facilities failed; nevertheless, services were held each Shabbat. Since there was a small group, practically every member participated in one way or another, whether it was carrying chairs, books and other equipment or serving refreshments at the Oneg Shabbat and Kiddushim. Adult Education classes were held at the Wilkoff home. In a short time, arrangements were made to use the American Association of University Women's Auditorium, which was located at East 14th Avenue and Josephine for Friday evening services. The charge for this rental was $25 per month. Rabbi Freeman taught Bar and Bat Mitzvah classes and within a year our 13-year-olds were celebrating their own special Mitzvot. High Holy Day Services were held in rented facilities such as Bonfils Theatre and the Greek Orthodox Church. Religious School classes or Talmud Torah, were held in various rented facilities, such as the old Hillel School Building and various church school rooms. We were scattered for many of our activities, but we were still one. Rabbi Freeman soon left for another pulpit and Rabbi A. Nathan Abramowitz came to Congregation Rodef Shalom. Because of the great need for facilities to handle the growing Synagogue's Services, as well the numerous classes, meetings, and activities, a Building Fund Drive was held, and ground was purchased on the 400 Block of South Kearney Street. Building started for a combination Sanctuary, Social Hall and Kitchen upstairs, with offices and school rooms downstairs. It was a great thrill to move into this new building in late 1959 and install the basic furniture and equipment necessary for our needs. As soon as this was done, however, it was realized that the building was much too small and although it would serve as a temporary facility, a much larger and more elaborate building would have to be built, in what they hoped would be the not too distant future. The Synagogue continued to grow and develop, however, we still were not able to start our new building during that time. The Building fund drive of 1964 was successful and the financial details were arranged. 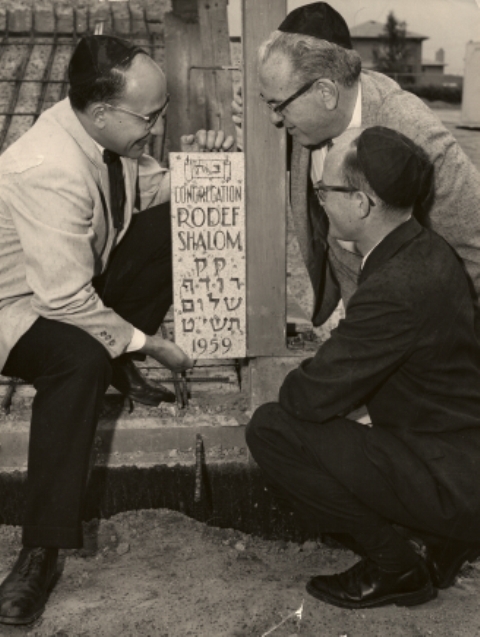 Ground was broken on October 3, 1965. The membership was delighted to watch the new building grow, and in 1966 we moved in. The original building was remodeled and used for a school building. Congregation Rodef Shalom finally had a permanent home. The early 1980's were dominated by issues of growth. The Congregation had grown rapidly to over 450 member units and had clearly outgrown the existing facilities. Furthermore, many young families had moved to southern suburbs and desired a more convenient location for the religious school. In 1982, the overflow crowd at High Holy Day services were accommodated in a tent in the parking lot. Various solutions were offered, including a major architectural renovation of the existing synagogue, or moving the congregation to a new, southern location. The issue was painfully divisive but ultimately resolved when the Congregation voted in April, 1983 to remain in the current location and establish a "school presence" in the south. A direct outgrowth of this decision was our affiliation with Beth Joseph and BMH in the Community Talmud Torah. In the following years, we made major cosmetic changes to the Synagogue, although the basic structure of the facility has remained the same. Rabbi Joel Newman became our spiritual leader in late 1986 and served the Congregation until the summer of 1992. During that time, he was assisted by Presidents Steve Zimmerman, Marilyn Bogan, Allan Rosenbaum, and Elaine Tinter. Rabbi Newman instituted a number of new programs including Young Family Services, Tashlich as a Congregational event, the Ecumenical Seders, Confirmation trips, and reinstituted "Shabbat under the Stars." Many of these programs continue today. The Congregation also acquired the Holocaust Torah Scroll and other "Precious Legacy" items as well as our beautiful Ner Tamid. Rabbi Gerson was engaged in the summer of 1993 and has helped to clarify our understanding of Conservative Judaism and Jewish traditions. Shabbat Services are well attended and there is steady attendance at Sunday minyan followed by Talmud class. Members of Makor read Torah on a regular basis. Rabbi Gerson retired after 25 years, and Rabbi Rachel Kobrin became the current Rabbi in the summer of 2018.